Last week my friend Sam came over with what seemed like half of her kitchen and a huge load of beautiful vegetables from Shipton Mill‘s biodynamic garden. Much of the booty became salad (see my previous post on cooking from Ottolenghi), but the vegetable that eluded us was marrow, perhaps the most substantial and most plentiful item in the Shipton veggie stash. Marrow is a vegetable that I’d only heard of since moving to the UK. 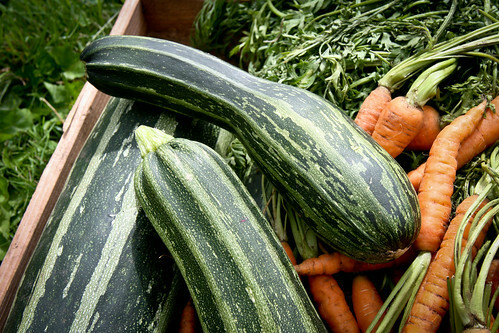 It’s like a ginormous zucchini (aka courgette), and like zucchini, is very easy to grow. As a result, it’s very easy to end up with marrow glut (as I’m sure the gardeners at Shipton Mill can attest to). I never really understood why people bothered growing marrow when zucchini seems far more easy to deal with. But I was willing to give it a try and reached out to the Twittersphere for suggestions. 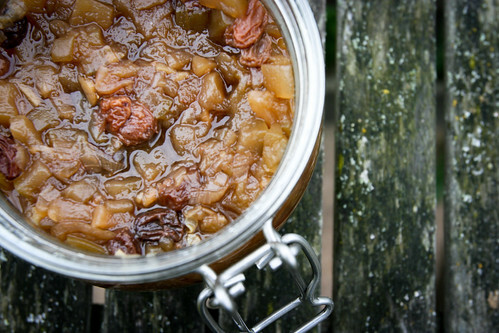 Elaine Stocks came back with this Marrow Chutney recipe from the BBC Good Food website so I thought I’d give it a go. 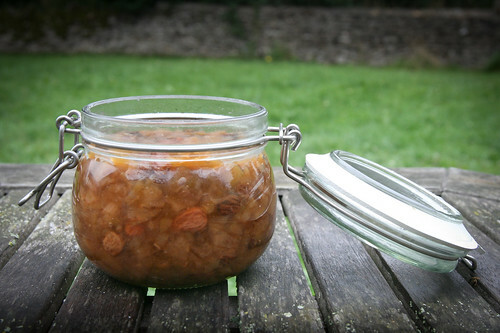 A little bit of a disclaimer: I’m not a massive chutney fan, especially of the typical apple and raisin variety. It’s not so much that I don’t like chutney, it’s just that I don’t eat much of the things that chutney typically goes with: namely meat and cheese. So while I enjoy making chutney, I’m usually hesitant to do so because it just ends up sitting around taking up valuable shelf and jar space. However, this marrow chutney appealed because it contained ginger and suggested that it might go well with Indian food (something I do eat quite frequently and often enjoy with mango and ginger chutney – particularly in curried omelets and chickpea flour pancakes – so why not marrow and ginger chutney instead?). 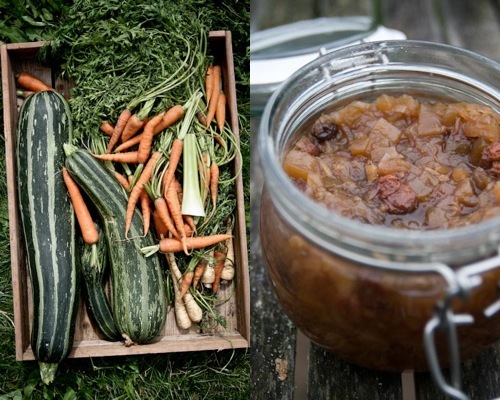 So I did make the chutney – which used up two marrows! – and before I tell you how it tasted, let me report on the process which was a moment in my country living experience that made me laugh. The day I made the chutney, I also had Airbnb guests coming to stay and so was also baking bread, too. The moment my guests arrived happened to be exactly when the bread was coming out of the oven and the chutney was bubbling away in the pan. Add to that the gentle breeze bustling around the apples in the orchard, birds dancing around the bird feeder and my dog Rocky‘s eternal – but polite – exuberance at meeting new people, I was feeling pretty good about having lived up to the foodie countryfile portrait I’d painted of myself and my cottage on Airbnb! The best part was when my guest exclaimed how good the chutney smelled and went right over to the pot to have a whiff (she is a Brit who lives in France and I suspect she’s been missing her British food). To my great relief, the chutney tastes as good as it smelled. It’s got a good hit of ginger without being overpowering, but what I really like is the texture that the marrow brings. They’re soft, but discernible. They also work flavour-wise. I find most chutneys to be cloyingly sweet, but the marrow creates a good balance. The real proof of its goodness is in my guests’ response: they’ve had marrow chutney with Keens cheddar and toast for breakfast for the last three days (over my other breakfast options which include yogurt, fruit, muesli, almond butter and jam). They’ve also been saying that the chutney gets better and better with each passing day. The next test is to see how the marrow and ginger chutney goes with Indian food. I think it will work. Adapted from [url href=”http://www.bbcgoodfood.com/recipes/2412647/marrow-chutney” target=”_blank”]BBC Good Food[/url]. The weight of the marrow is BEFORE peeling and de-seeding. I was also short on malt vinegar so used about 550ml malt vinegar and 300ml of apple cider vinegar. I also used golden delicious apples but I suspect any apple will do! 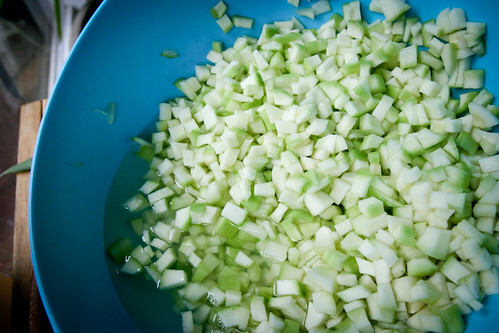 Cut the marrow into small pieces (about 1cm dice), put in a large bowl and sprinkle liberally with 2 tbsp salt. Cover and leave for 12 hrs. 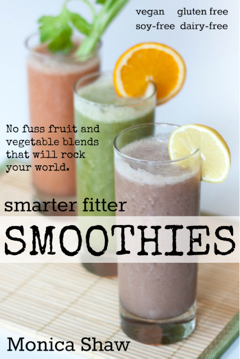 You should wind up with a lot of liquid at the bottom of your bowl. Rinse and drain the marrow, then place in a preserving pan or large saucepan with the shallots, apples, sultanas, ginger, sugar and vinegar. Tie the peppercorns in muslin (or put into a small enclosed tea strainer) and place in the pan. Bring to the boil, then reduce the heat and simmer, stirring from time to time, until the consistency is thick (I simmered mine for a couple of hours, though the BBC’s website says “cook time” is 25 minutes; I suppose it all depends on how much moisture is in your ingredients!). Leave to settle for 10 mins, then spoon into sterilised jars (see tip on [url href=”http://www.bbcgoodfood.com/technique/how-make-chutney” target=”_blank”]BBC Good Food[/url]’s website), put on the lids and label. Will keep for a year in a cool, dark place. I’m delighted with this recipe as we have grown a few marrows this year so good way to use them up.